Flipit, a global money saving voucher / coupon platform, recently launched in India. We were slightly surprised with this launch, given the fact that this space is already quite saturated with truckloads of coupon/deal sites already present in India. We spoke to Jochem Vroom, founder Flipit.com, who is an online entrepreneur and controversial blogger from Netherlands, in regards to Flipit’s India launch and how do they plan to grow here in India. 1 1) What is Flipit? 3 3) Why did you decide to expand to India specifically? 4 4) Do you think there is still space for growth in this particular vertical? 5 5) Google is changing market dynamics, which is especially true for e-commerce and product aggregation sites. What if Google plans to integrate Coupon/discount codes in the search itself? 7 7) Can you talk briefly about your revenue model? Flipit is a global money saving voucher platform. It is our believe that online shopping can be much more effective – cheaper and it can be much more fun. With Flipit we are personalizing the use of coupons and India is one of the first countries that we have launched in. Couponing websites are not a new thing. They have been around for quite some time. We have a lot of experience building a large additional reach and added value for publishers we work together with. We focus on building great relations with them, so we are able to offer our visitors exclusive coupons that they will only find on Flipit. This in turn creates loyal visitors and the unique codes we are able to offer sets us apart from our competitors. Besides the unique content that we offer, we are continually evolving Flipit. We are starting out with a couponing platform, but our goal is to offer our visitors the best moneysaving experience possible, while creating added value for the advertisers we work closely with. Flipit might evolve into something completely different than a couponing site, it might even become a Google Glass App in the future for instance. We don’t know yet and that makes it a lot of fun. 3) Why did you decide to expand to India specifically? There are many factors that make India a very interesting market for a couponing/money-saving portal. Because of the sheer size of its population, India is of course interesting for any online marketing venture. The amount of online shops that offer coupons in India is however unheard of in other countries. 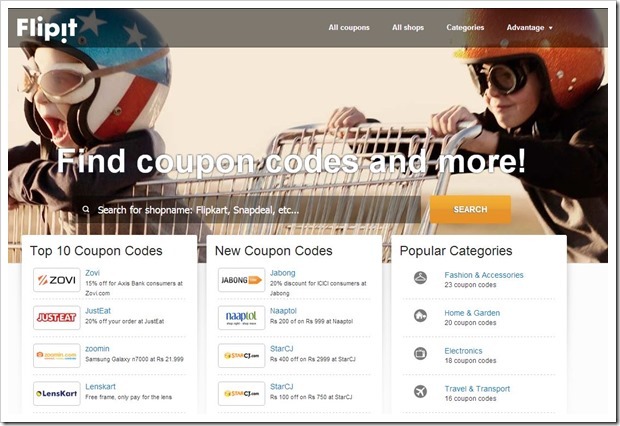 Almost every web shop has multiple coupons available. This means both consumers and advertisers are ready for a couponing platform the size of Flipit. 4) Do you think there is still space for growth in this particular vertical? Absolutely. Like you already stated in your previous question, there are many couponing sites already present. However, they don’t really offer unique content yet. I don’t see a lot of innovation going on, or the will to do anything new. Personalization of the content that is offered for instance. With a Flipit account, you can add web stores to your favourites. By doing that, the content you are offered is sorted by your preferences as much as possible. A 18 year old student or a 50 year old housewife are looking for completely different discounts and should be offered them accordingly. 5) Google is changing market dynamics, which is especially true for e-commerce and product aggregation sites. What if Google plans to integrate Coupon/discount codes in the search itself? Google integrating coupons in their SERP has always been a possibility and I don’t really see it as a threat. Google doing this would be harmful for advertisers. Advertisers don’t want visitors being ready to order and then go search for a coupon to get an extra discount. They want extra promotion and added value. They want publishers like Flipit to send them traffic they would not have had otherwise. I have always advocated that advertisers should look very closely at the couponing portals they work together with. I don’t think Google can offer the added value Flipit can in couponing terms. We are not interested in short-term gains, only in building a big global brand. Our priority is to get as many exclusive partnerships as possible and offer our visitors the most complete overview of available coupons. During the coming period we will be continually adjusting Flipit as must as possible to the wants and needs of our visitors in India. We will also be looking into expanding to more countries in Asia. 7) Can you talk briefly about your revenue model? Our core business has always been based on performance based marketing. It is very effective no-cure-no-pay business model and offers a great deal of autonomy for becoming an independent brand, like we are doing with Flipit.com. It basically means that if someone uses one of our codes to buy a product with an advertiser we work with, we get a small commission over their order. By building long-term relationships with our advertisers and helping them strategically use coupons, we will be able to offer our visitors the most unique content and best discounts, which in return creates loyalty. Companies like Amazon entering the Indian market are clear tell-signs that India has enormous potential in growth. According to the Internet and Mobile Association of India, the online advertising market in India grew at a rate of 29% year-on-year. That is massive. I was amazed to see how many very big online department stores like Homeshop18, Flipkart and Yebhi India has. India has more of these big online stores than any other country I have seen so far. The couponing scene in India is already booming and as the internet penetration will grow in the next few years, so will its couponing industry. There are a lot of challenges lying ahead, but we will be working very hard to secure more deals and be at the forefront of the enormous online growth that lies ahead in India. "Flipit Launches in India [Interview With Founder]", 5 out of 5 based on 1 ratings. Bharti Airtel Slashes 4G Tariffs, Starts Offering Goodies! Also IndiaPriceCompare with over 10K + deals published in a very few time.